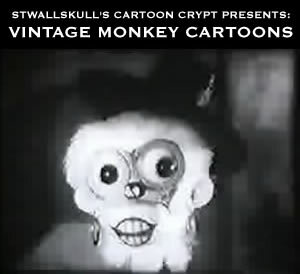 STWALLSKULL’S CARTOON CRYPT PRESENTS: Vintage Monkey Cartoons! I decided to round up the whole barrel full of monkey cartoons in one convenient place… 25 of them so far! Click the image to go there. El Mono Relojero AKA The Clockmaking Monkey (1938). I read about this cartoon originally on Cartoon Brew here… go there to read more about it. According to Jerry Beck at Cartoon Brew this bizarre and hilarious cartoon from Argentina is only surviving film by the creator of the first animated feature film (El Apostol, 1917), Quirino Cristiani. Go here to view other vintage monkey cartoons on this site. The first cartoon in the Beppo the Gorilla trilogy. 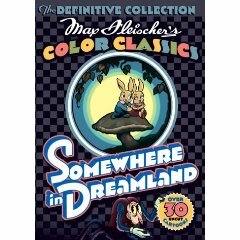 I was thrilled the other day to run across the DVD set Max Fleischer’s Color Classics: Somewhere in Dreamland . I don’t know how this escaped my notice previously. I’m a big fan of the Fleischer brothers, and I’ve been hunting down the Color Classics cartoons on the internet recently to see them all. Now I don’t have to… the collection has all but one of the Fleischer Color Classics included (“Tears Of An Onion,” which is apparently still copyrighted and couldn’t be included). The cartoons I’ve watched so far, while they don’t appear to be completely restored (the colors I imagine were much more brilliant in the 30’s), are in much better condition than I’ve ever seen them (I have a number of the cartoons on other cartoon collections). The cartoons themselves are fantastic. The center image on the cover of the DVD is from the cartoon Bunny Mooning. This one is so saccharine-sweet, it is surprising it came out of the Fleischer studios… I’m guessing it is one of the worst cartoons on the set. It is still a lot of fun, though! It’s definitely no Dancing on the Moon (my favorite so far)! I’ll probably post more about these cartoons as I make my way through the set with my 2 and a half year old daughter, Esther (Dancing on the Moon is her favorite too).